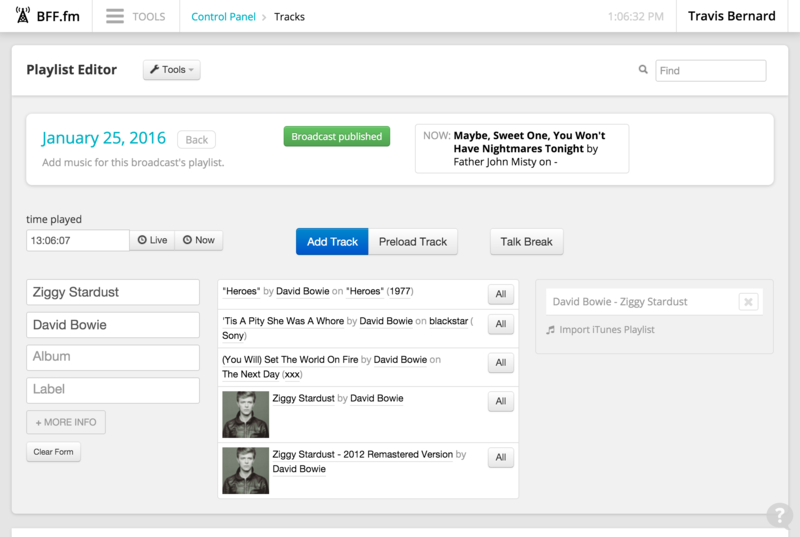 You can build playlists that contain information about each song played during a broadcast. Make sure that the correct date and time for the broadcast is selected. If you have more than one show, make sure that you select the right show. Optionally, add some text or media to the broadcast. If you aren't already, make sure that you are on the broadcast editor for the intended broadcast. Click the Add Playlist button. You'll be taken to the playlist editor. Enter the track information — artist, album, title, label, and so on. Make sure that it has the right time. It is important to pay attention to the track time of each track. Try using the live button to make the clock update with the current time. Just make sure that the times reflect the actual future play times — supposing they were played during your recording on the broadcast date. Also, check out the "fix track times" tool. You can use this to record your show as if it were live, but at an earlier time of your choosing. Just enter the tracks with the current time. Then, after you are done, just shift all the track times to the correct hour. If you have a live show, make things easier by loading up tracks beforehand. Then, when you actually play the music, you just need to click the preloaded track, and enter the times. Check out the track-preloading tutorial. Need to fix all the track times? Check out the "fix track times" tutorial for how to use this tool. Time played: When you started playing this song. Link: a web page link associated with this track. Good for linking to a band's homepage, for example. Sending out metadata - Icecast, Tune-in, etc. Creek can send out the metadata to various services. Check out the article about this here.